Photographer Phebe Pan snapped this picture on August 13th while attempting to catch a shot of a Perseid meteor. 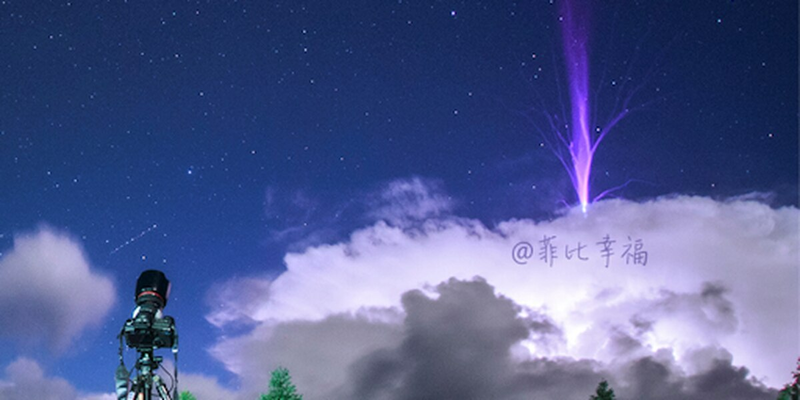 He captured the shot while working up on Shi Keng Kong, the highest mountain peak in the Guangdong province, according to spaceweather.com. According to Oscar van der Velde, of the Lightning Research Group at the Universitat Politecnica de Catalunya, what Pan captured is known as a gigantic jet, which is similar to a sprite. He added, "Gigantic jets are much more rare than sprites. While sprites were discovered in 1989 and have since been photographed by the thousands, it was not until 2001-2002 that gigantic jets were first recorded from Puerto Rico and Taiwan." Only dozens are known to have been spotted. The jets are a bit like lightning discharges that pop out of the top of thunderstorms. They can reach over 50 miles up in the air. Copyright 2016. Tucson News Now. All rights reserved.